Options: 20 lb. 5 lb. 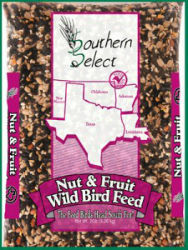 Songbirds, Buntings, Grosbeaks, and other Nut and Fruit loving birds enjoy this blend of Black Oil Sunflower, White Millet, Red Milo, Peanuts, Safflower, and Raisins.